Should coach Sanchez keep his job after UNLV's come-from-behind victory against Nevada? A perfect microcosm of UNLV's 2018 season existed in the first possessions of that game against Nevada. On its first drive, UNLV had a 3rd down and 4, and a 4th down and 4, that they failed to convert. Both failures were off of 50/50 balls that were thrown deep along the sideline. On its first drive, Nevada had a similar situation, in which it had to convert a 3rd and 3 (or 4) and later a 4th and 2. They succeeded on both conversions by throwing short drag routes to wide open tight ends. In both cases, the tight end broke the play for a big gain, and the 4th down wasn't just converted for a first, it was converted for a touchdown. Now, we could chalk all this up to poor execution by UNLV. But it's not just poor execution; it's bad play-calling. UNLV is one of the best rushing teams in the nation (they are ranked 22nd now, but I think they were 30-somethingth going into the game), but they couldn't trust their running game to convert a 3rd and short/medium? Worse yet, instead of calling a safe drag route, or quick out, or getting the running back open in the flats, they threw up two 50/50 balls down the sideline? I could understand trying to take the shot play on 3rd down if you are already expecting to go for it on 4th. A good stop-and-go route could catch the defense biting on the short pass and leave a receiver open for a big play. But why would you try the same failed concept again on 4th down? Sanchez routinely squanders convertible 3rd downs by calling 50/50 passes down the field. This is typical of UNLV this season. I can't count how many times I've watched UNLV squander a convertable 3rd down on a failed jump ball along the sideline, or on the QB overthrowing a receiver running a post route down the middle of the field. Drive after drive, game after game, they just refused to call a play designed to get 4, 5, or 6 yards and the first down, and instead called plays down the field. Is the coach calling plays on 3rd and short/medium that are intended to go down the field? Or is the QB just making bad reads and not throwing to the underneath receivers? Either the coaches are calling the wrong plays, or the QB isn't being coached to be aware of the situation. That's bad coaching, either way. Get the first down first, then you'll have three more plays to take shots down the field. Somehow, UNLV managed to pull off an upset, come-from-behind victory to beat Nevada 34-29, after having been down 23-0 early in the second quarter. The team is currently celebrating by painting the Fremont Cannon red, while coach Tony Sanchez gets ready to start hitting the recruiting trail. 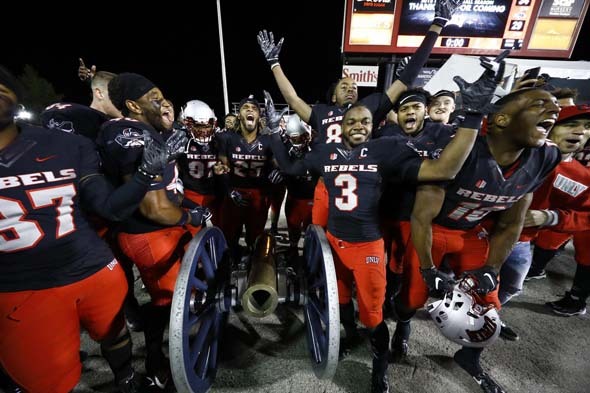 UNLV came back from a 23-0 2nd quarter deficit to beat Nevada and bring home the Fremont Cannon. In the meantime, however, UNLV's higher-ups are mulling over whether or not to keep Sanchez on for the 2019 season. UNLV was expected to win six or seven games in 2018 and make a bowl bid, but they ended the season with only four wins. UNLV won't be bowl eligible in 2017, but did they deserve a bowl to begin with? With this weekend's loss to a two-win (now three-win) Nevada team, UNLV will end the 2017 season with a record of 5-7 -- one win shy of the 6-6 record that is usually the threshold for qualifying for a bowl bid. UNLV failed to execute on third downs throughout the game, settling for multiple field goals and failing on several fourth down conversions that ended up deciding the game. The Fremont Cannon will remain blue for at least one more year. 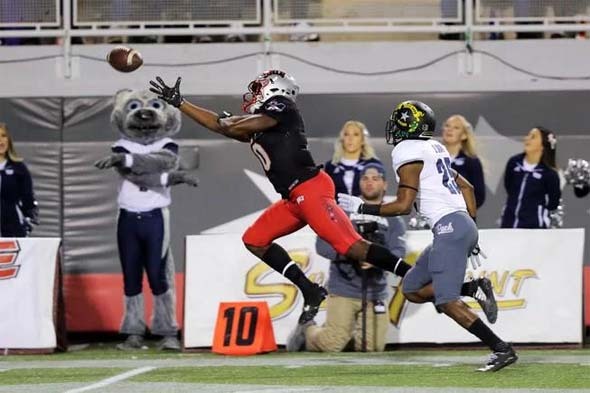 UNLV couldn't convert key third and fourth downs in their loss to Nevada. By the way, Nevada Wolfpack: nice helmets. The big question is: even if UNLV had won the game and ended the season 6-6, would hey still deserve a bowl invitation? If you ask me, the answer would be "no". The 2017 season has been defined by disappointment and a dash of embarassment, starting with their week 1 loss to Howard. UNLV also gave up a huge lead to Air Force to lose that game. As far as I was concerned, that was the end of UNLV's season; that was where I gave up hope. But UNLV also dropped a game to a three-win BYU team and a four-win Utah State team. UNLV only had one upset win of their own, against a heavily-favored Fresno State team that ended its season with nine wins. For me, it was those multiple, embarrassing losses that defined the season, rather than the one upset victory. Even if UNLV had beat Nevada, they still may not have received a bowl invite. There's apparently a lot of 6-6 teams in the NCAA this year, and not enough bowls for them all to get invites. So UNLV may have been snubbed anyway. I certainly wouldn't have selected this team if I were on a bowl-selection committee. Prior to UNLV's season-closing game against rival Nevada, head coach Bobby Hauck announced that he would be resigning after the season. It's unfortunate that Hauck couldn't accomplish more in his time at UNLV. He had a repuation as a winner at Montana, and his teams at UNLV definitely had the talent to be successful. But the team was inconsistent, often playing well for half a game and then crashing and burning in the other half. Third quarters were real killers for UNLV this year, as the team regularly collapsed and allowed their opponents to break away after halftime. And that is exactly how UNLV lost (49-20) in Hauck's final game against rival Nevada. Hauck accumulated four seasons with only two wins, as well as one outlier year in which UNLV won seven games and earned a trip to the Heart of Dallas Bowl on New Year's day last year (which my dad and I attended). It's hard to tell where exactly the problem was. I had some issues with the decisions that were made by Hauck and his staff over the years. Specifically, I thought that Hauck set up former starting quarterback Nick Sherry for failure. Sherry performed well as a pocket-passer in his first few games running a west coast-style offense, and when the Rebels starting running a spread pistol formation focused around the read option, Sherry struggled. He was clearly uncomfortable as an option quarterback. He wasn't very mobile, he didn't make the right reads, and his accuracy and decision-making out of the pocket was terrible. So when Hauck continued to run that pistol spread offense, I was frustrated. Maybe Sherry handled it well enough in practice that Hauck honestly believed that he could handle it in games? But as game after game went by, and Sherry just kept looking worse and worse, it should have become obvious that he and that offense did not fit together. 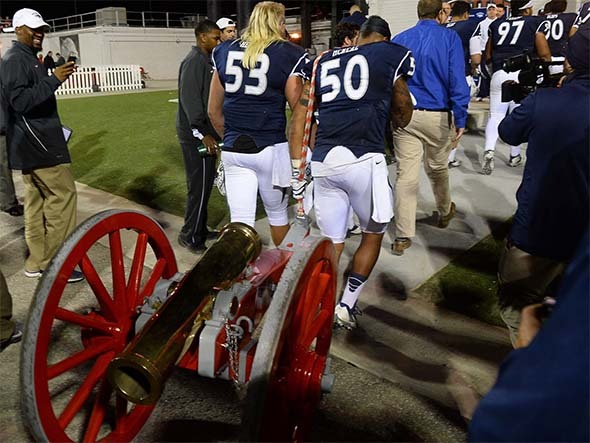 UNLV collapsed in the third quarter to lose the Freemont Cannon to rival Nevada. A sadly fitting - and representative - conclusion to Bobby Hauck's tenure at UNLV. But UNLV's players didn't make Hauck's job easier. Both the offense and defense were horribly inconsistent year in and year out. It's hard to tell if that was the result of bad coaching or just bad players. But there was definitely some physical talent on the field. UNLV has had a quality receiving corp during most of Hauck's tenure, but aside from Caleb Herring, they just didn't have a quarterback that could reliably get them the ball. And even when the ball was on the mark, those receivers still dropped quite a few of them. 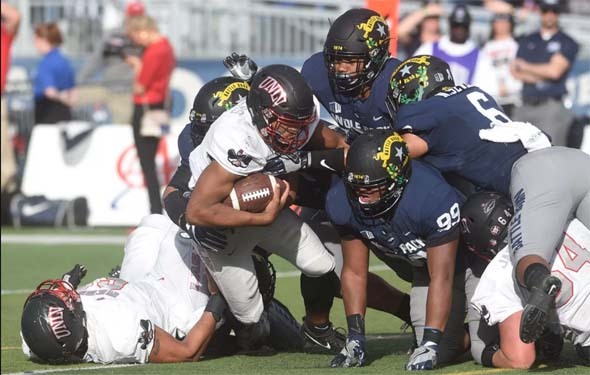 The offensive line had trouble stopping blitzes, and the defense struggled to fill gaps and make tackles, leading to opponents regularly accumulating over 200 yards rushing against UNLV. So it's difficult for me to be able to say with any degree of confidence whether Hauck was unfit for the job. Texas has invited UNLV to go bowling! 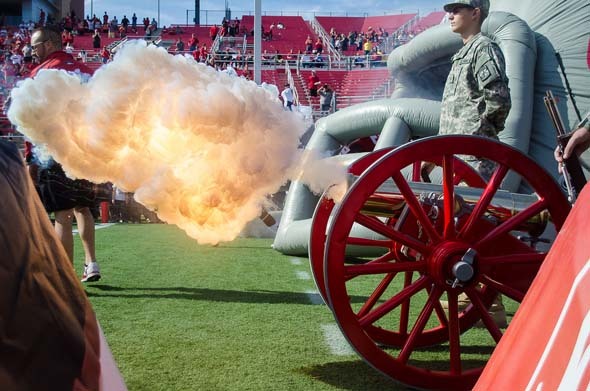 The Freemont Cannon, properly painted red, is fired during the pre-game ceremonies of the UNLV vs. San Jose State. Back in October, I expressed some doubt that UNLV's head coach, Bobby Hauck, would be able to retain his job despite a four-game winstreak. I also expressed doubt that UNLV would be able to attend a bowl this year. This team has been a disappointment for over a decade, so I've become quite used to keeping my hopes low. But then UNLV went on to do all the things that I'd hoped they would do! Since my last post, UNLV did beat rival Nevada and return the Freemont Cannon to its rightful place in Sam Boyd Stadium. UNLV did hit the 7-5 mark and achieve their first winning season in over a decade. And they did that by absolutely crushing San Diego state (one of the best teams in the league) in the season-closing game at Sam Boyd. As such, Hauck has been rewarded with a new three-year contract with UNLV. Congratulations, coach! 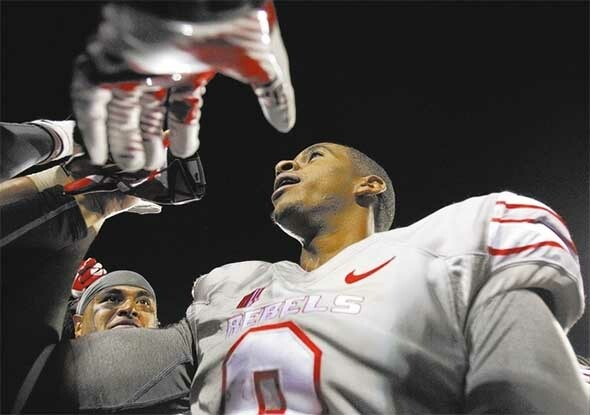 UNLV quarterback Caleb Herring celebrates with teammates after beating San Diego State. Well, I was wrong. UNLV has been invited to a bowl. The Armed Forces Bowl decided to invite a non-Mountain West team (Tennessee State), and so the Heart of Dallas Bowl is inviting a Mountain West representative instead: and that Mountain West team is UNLV. UNLV will be playing the bowl against North Texas on January 1st, 2014 in their first bowl appearance since 2000.